No matter how you define a dynasty in professional sports, winning four straight championships undoubtedly meets any definition. The banners hanging in one end of the Toyota Center in Houston say it all: 1997, 1998, 1999 and 2000 WNBA Champions, the first four in league history. The Houston Comets were the WNBA's first dynasty. With the legendary trio of Cynthia Cooper, Sheryl Swoopes and Tina Thompson surrounded by a nucleus of role players such as point guard Kim Perrot, Janeth Arcain, Tammy Jackson and more, the Comets won those rings in an impressive variety of ways. They defeated the New York Liberty in the inaugural championship game as Cooper won the league MVP Award. Swoopes returned from maternity leave in their second title season and increased her scoring average in each of the following four seasons. The tragic death of Kim Perrot to cancer buoyed and inspired the team to the 1999 crown even after surviving a highlight film, last-second, full-court shot by the Teresa Weatherspoon in Game Two of the Finals against the Liberty. For awhile there, it looked like the WNBA's Houston Comets couldn't lose. But ultimately, the Comets gave up the stage. Cooper retired, Perrot passed away, Swoopes and Thompson suffered injuries and other teams began gunning for them. In fact, Swoopes missed the entire 2001 season. But the league also got younger and the style of play changed. "First of all, there's definitely more talent in the league today than there was seven-eight years ago," Swoopes said. "I think the biggest difference is all of the young talent that we have in the league today. And when I look at the college game today, it's only going to get better." As one dynasty fell, another one rose. Led by former Lakers great Michael Cooper, the Los Angeles Sparks picked up the mantle and began an impressive run of dominance. Led by another trio of original WNBA players, Lisa Leslie, Mwadi Mabika and Tamecka Dixon, the Sparks won the next two titles and made it all the way back to the Finals for a third time between 2001 and 2003. "I thought that we could have held onto that top spot for a lot longer, but with the player movement, the talent level and the growth of the league and the expansion, it is difficult to keep things together, but that is the nature of this business and I would say," said Lisa Leslie, the Sparks center and the WNBA's all-time leading scorer. 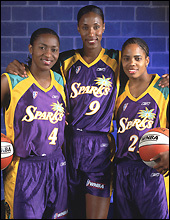 The L.A. Sparks were the second great WNBA team. But since those two teams won the six banners, no team has repeated. The Detroit Shock upset the Sparks, but lost in the first round the following season. The Storm reigned supreme in 2004, but could not duplicate that feat, also losing in the first round of the Playoffs the following season. 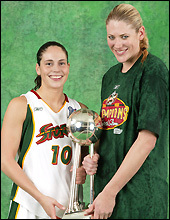 "The great thing about those teams was there wasn't a lot of change, they had Tina and Sheryl and Coop, those players were there for three and four years and they were able to get it done and they had the experience of winning," said Detroit's Ruth Riley, the 2003 WNBA Finals MVP"
So will we ever see anything like the Comets four-peat or the Sparks great run again? After all, the Comets did have three of the best players in the history of professional basketball together and healthy for that stretch. "I don't believe that the dominance of those two teams can be repeated," Comets forward Tina Thompson said. "I believe those were situations in which all the right pieces were together at the right time and those are things that are not really expected at first glance and then all of a sudden everyone else notices what those involved knew and believed in the entire time, plus a little bit of hard work, perseverance, determination and a lot of heart sprinkled on top doesn't hurt either." The Connecticut Sun have lost in the 2004 and 2005 WNBA Finals, but had the best record during the 2005 regular season and return virtually their entire team in tact. The 2005 champs, the Sacramento Monarchs, do as well. In reality, with a few breaks here or there, the Sun could be going for their third straight instead of the Monarchs going for their second. Either way, the pieces are in place despite the changes going on around them. "With free agency and all the talent coming out, it will be hard for one team to continually win on a regular basis," Detroit's Katie Smith said. There is that word again - parity. Free agency and the salary cap play a significant role, but is it that simple? The Sparks had their nucleus in place for a few more seasons, the Shock returned virtually the same team and the Storm have their young group of stars locked up for the next few years. Will we ever see another dynasty in the WNBA in the future? "Teams can keep their players together, just like Sacramento is doing. They won it all in 2005, are definitely among the favorites to win it all again," WNBA veteran Nikki McCray said. "Free agency also allows teams to continue to stay very competitive and that's a good thing - fill needs wherever they can"
Then, of course, there is the law of averages, which would indicate that the longer a league is around, the more likely a dynasty is to happen again. "Obviously the longer the league goes, there is a better chance of it happening," Mercury guard Kelly Miller said. "So I'd say it's definitely possible under the right circumstances." But that does not mean it will be easy. The last NBA team to win four titles in a row were the Boston Celtics of the 1960's. Hockey's last four-peat came in the early 1980's (New York Islanders) and the New York Yankees were the last team to win four or more World Series championships consecutively (1949-1953). No NFL team has ever won four Super Bowls in a row (no team has ever won three). All of those dynasties existed before the advent of free agency. So what do the real experts think? "To run off one and two was tough but probably can be done at some point in the future," Leslie said. "Three to four, I doubt that we will ever see that again."